After my last post about plant screens in Russian interiors, I came across the magnificent interior views of the Winter Palace in Saint Peterburg, as published by De Gourcuff Editions in 1994, with texts by Emmanuel Ducamp, a great expert on Russian interiors and furniture. 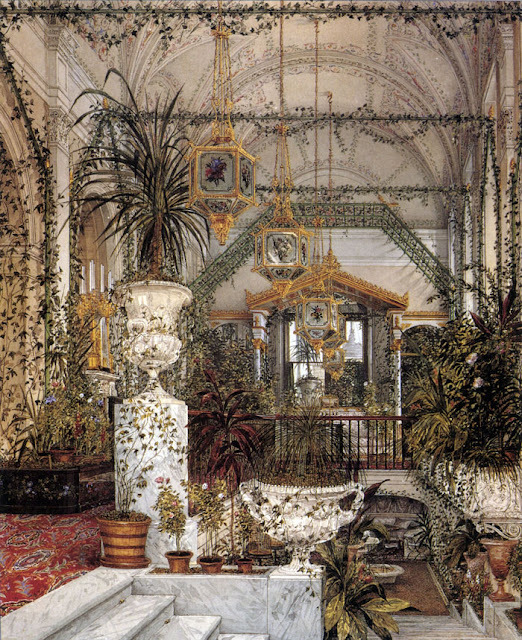 They date from between the 1830s to the 1870s and they show how much the Tsarinas loved having plants in the rooms, especially the Empresses Alexandra Feodorovna and Maria Alexandrovna. Besides large flower and plant arrangements in varoius private rooms, the palace had two rooms that were wholly dedicated to plants; the Winter Garden and the Small Winter Garden. 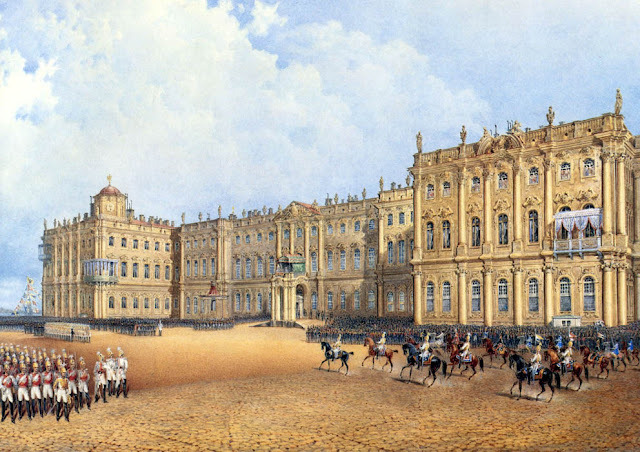 When after a huge fire in 1837 substantial parts of the palace needed rebuilding, a large, double height, winter garden was installed that overlooked the palace courtyard. 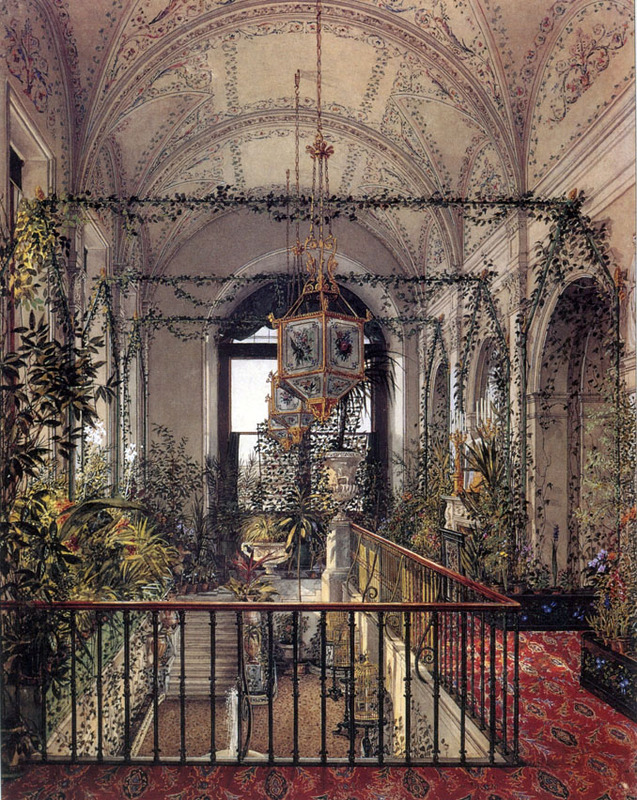 We would now call it a 'state of the art' affair, as the windows in the ceiling could be removed for air and sunlight and plants could be brought in from the floor below through a trap door. This is the south side of the palace during a military parade. Interesting are the various little balconies, that were presumably light, wooden constructions, clinging to the outside wall like birds nests on the edge of a cliff. 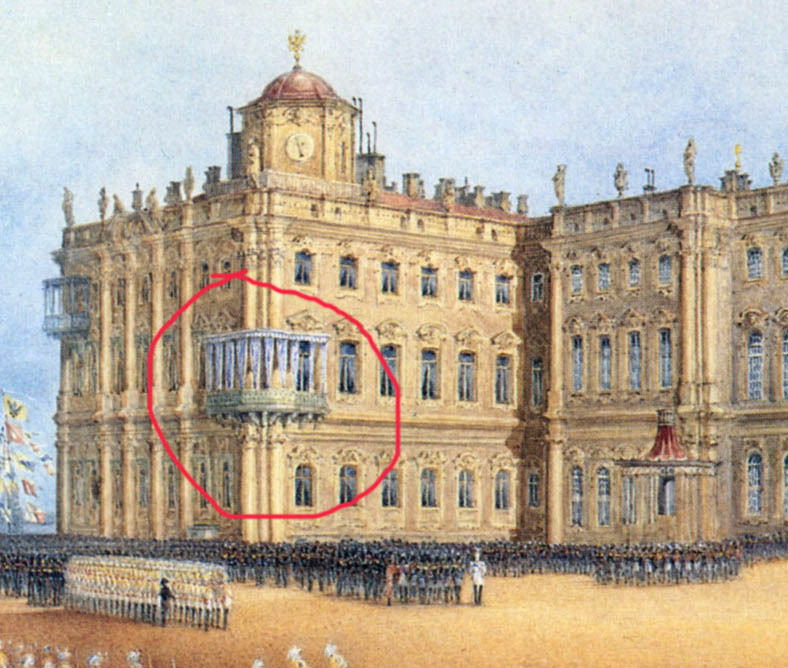 With all the pomp and ceremonial life of the period the Winter Palace must have offered precious little in the form of privacy or anything that looked like a pleasant place to sit and gossip. 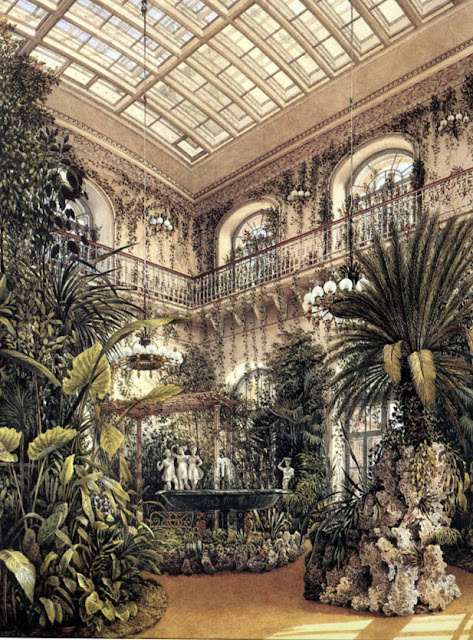 The Palace was in the middle of a very grand city and had no garden, so these winter gardens offered a connection to nature and the outside, however artificial. Apart from the large and formal Winter Garden, there was also the Small Winter Garden, right next to the Empress's own rooms. It had one of these balconies and must have been a very private space. Here is the palace from the river, which shows what a fabulous view the balcony must have had. To the left, towards the river, were the rooms for the Empress, which faced south west and must have had beautiful evening light. 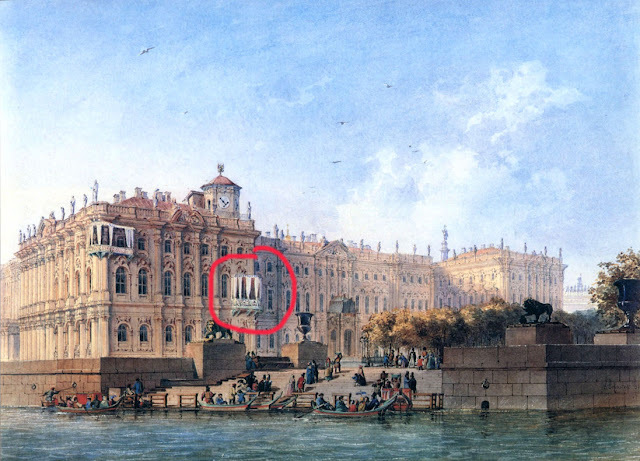 On a side note, these images also show that the Winter Palace wasn't always painted in the blue green that it is today. I presume that is a reconstruction of what is thought as the orginal, 18th century colour, which certainly gives the building an instantly recognisable look but I find rather hard (not to say electric, particularly the side that faces the square). ... ready to receive all sorts of plants, individual pots and lots of ivy. Narrow poles were also fitted across the room and around the alcove at the end and around the arches and the windows, all smothered in ivy. The mirror in the alcove on the back wall must have heightened the sense of exotic luxury, reflecting the row of Chinese style lanterns. And in this view from the other side of the room we get a glimpse of the space downstairs, where birdcages stood on wooden stands. Alexandra Feodorovna (1798-1860) was born in the Scharlottenburg in Berlin as princess Charlotte of Prussia. 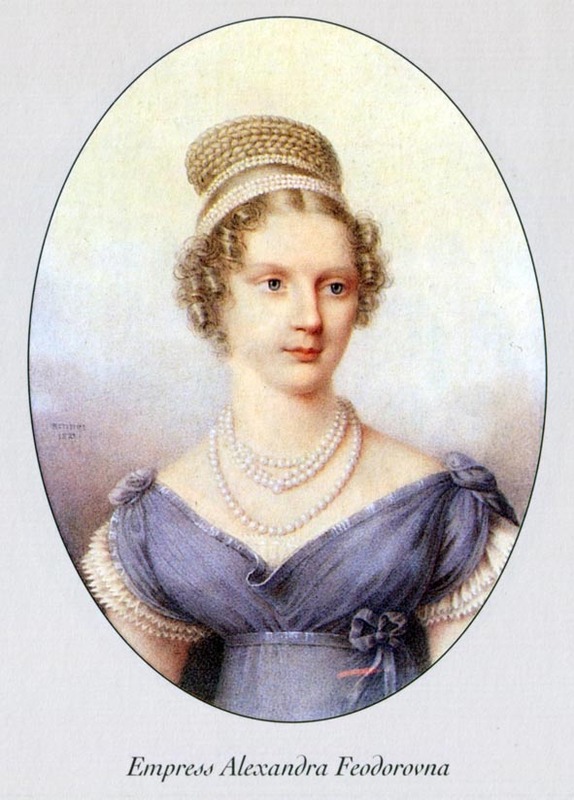 She was a rather private and frail woman, who remarkably chose to spend the 5 years of her widowhood in the company of her husband's mistress. 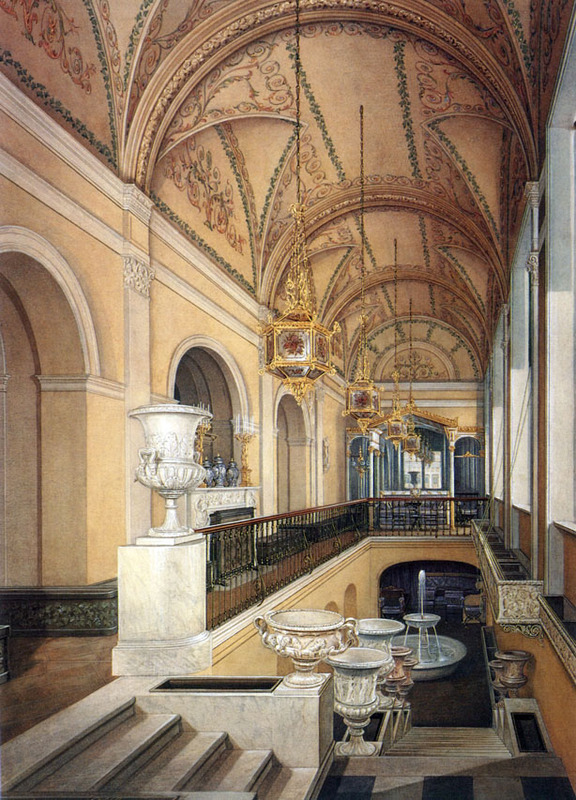 Yes I love that too, the painter was obviously given 'access to all areas', but not when the Empress was in residence. 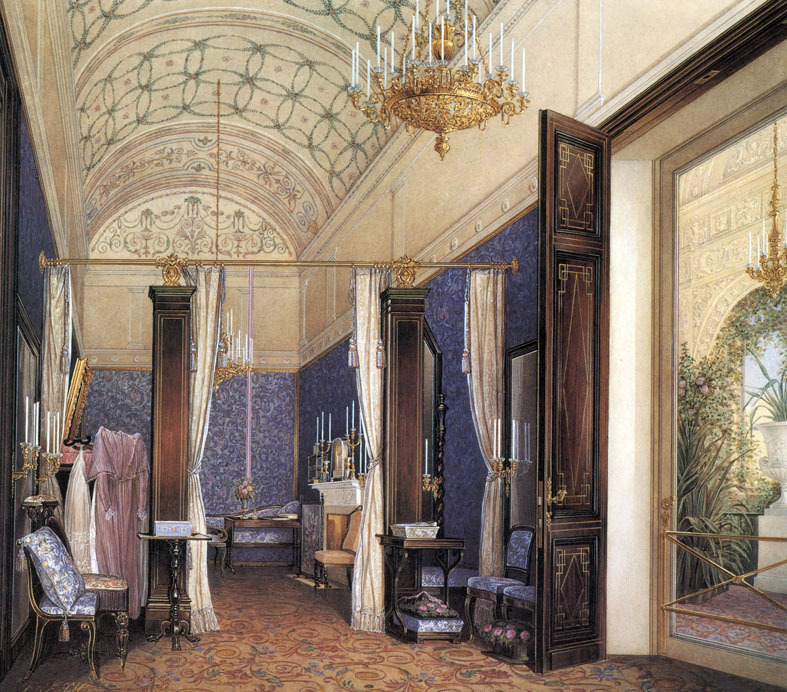 It seems odd though to commission a interior view like that, which must have taken some considerable time, of a room that was clearly 'déshabillé'. I am intrigued by those odd balconies, which don't seem to match the building, and are distracting. I wonder if they were meant to attract attention from the outside, while possibly providing privacy from the inside. The balconies allowed the Tsar and his family to watch the military parades that used to be held on that side of the palace. The first image shows one of these going on and there are people painted under that awning above the door in the centre of the facade.